When Pacific Gas and Electric along with Johnson Controls team members stopped by Mobile Pro Systems’ booth at ISC West this spring, they were impressed. Seeing the quality of the Commander 3400 trailer up close with its superior engineering and design, led them to the decision to purchase. It also drew them into a conversation with the pros at MPS about another type of product they hadn’t seen, but knew they needed. Construction and mobilizing resources are on-going for this giant in the utility services industry. They are constantly building and upgrading substations or responding to power outages such as those caused by massive wild fires—all of which requires relocating their equipment and personnel to work from encampments or bases. Many workers, large equipment and expensive replacement parts and materials flow in and out of each base. Securing and coordinating the activity at these temporary work sites would typically include building a station at the site entrance to house guards tasked with clearing personnel and logging incoming and outgoing traffic. Commonly known as a ‘guard shack’, these outposts are not inexpensive to put up. They require pouring a foundation for the building and gate control arms, cabling for electricity, power and a host of other features. But once a project has run its course, the structure is torn down or discarded, and the next one must be built, and the cost and time required to do so repeats itself. 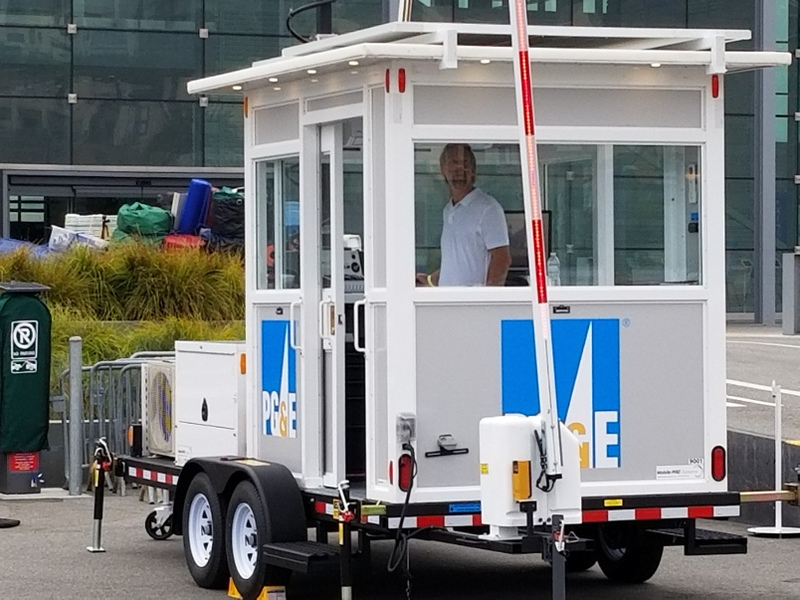 PG&E and JCI approached Mobile Pro Systems with some questions: Could you create a mobile, re-deployable guard shack that included surveillance, lighting and gate access control arms? What would it take and is that even possible? Rob Gornick, CEO and founder of Mobile Pro Systems took the idea under his wing and immediately began to do what he does best: shepherd a project from concept to completion—and he did so in a mere few months. By mid-August, the CheckPoint was on its way to a PG&E security/tech fair event held at Pier 27 in San Francisco. There, attendees had a chance to step inside the brand-new CheckPoint and admire its features. The Commander 3400 was also featured at the tech fair. MPS team members were on hand throughout the event to field questions and perform demos. The reviews were extremely positive and PG&E plans to add a number of units to their field operations. CheckPoint is officially in production and available to all MPS customers. To learn more, contact us or call 651-434-2333.